Are you tired of suffering from hallux valgus deformite? Enough suffering from pain and discomfort. Best doctors recommend bunion corrector to reduce bunion pain. These premium bunion splints are designed by professionals to reduce bunion pain and get you back to a normal life. Bunion splint is a modern medical product for correcting deformation hallux valgus your foots. Those device provides maximum comfort due to ergonomic design replicates the anatomy of your foot. The design of two adjustable straps, a built-in metal plate and a soft silicone pads provides tangible relieve of the pain in the area of the big toe. It is the best toe straightener and most comfortable hallux valgus treatment splint you can use these bunion pads during the day, and night. SATISFACTION GUARANTEE: Dortz tries to satisfy the wishes of each customer. We highly appreciate your gratitude and trust. We are sure that our bunion support will solve your problem and you will become our next satisfied customer. ERGONOMIC DESIGN & QUALITY MATERIALS: these orthopedic bunion correctors are made from high quality materials such as medical textiles, plastic and built-in metal plate are used. Tailors bunion are comfortable and easy to use. Modern design replicates the anatomy of your foot and gives them a natural shape. RELIABLE PROTECTION: protect your foots with our selected 5 pieces set. Our product is designed for bunion sleeve and bunion aid. One size for feet of any size. 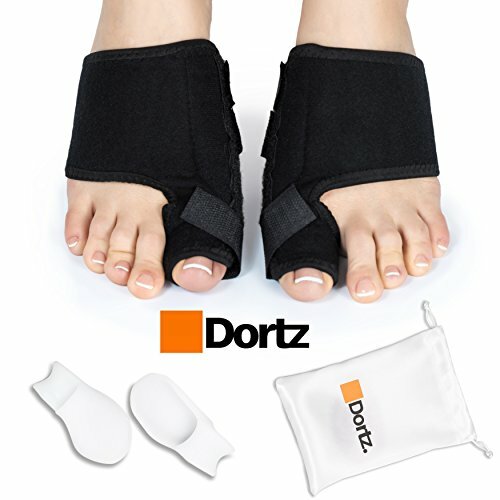 If you have any questions about this product by Dortz, contact us by completing and submitting the form below. If you are looking for a specif part number, please include it with your message.